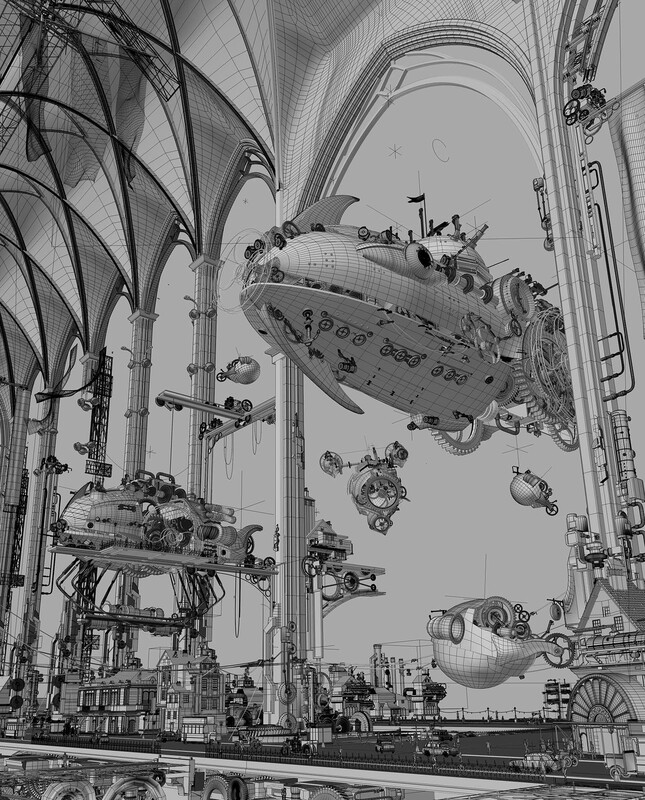 I’m excited to present the making of “Her Majesty’s Zeppelins”, full version. 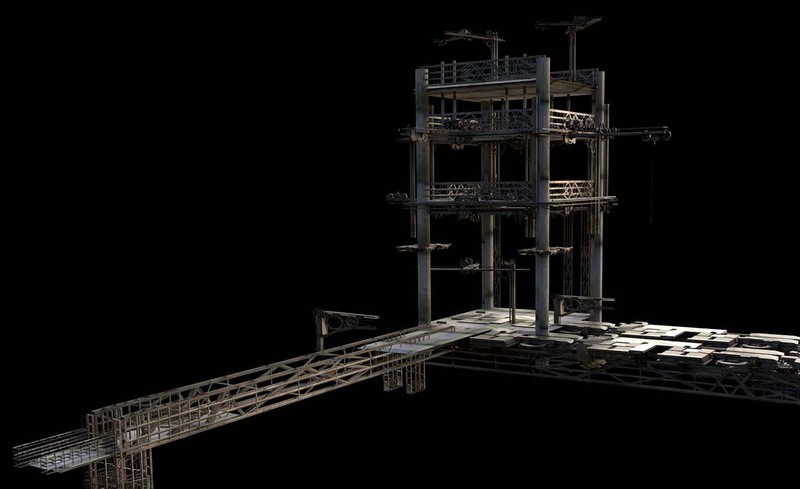 We’ll touch various aspects of Blender: modelling, making uv layouts, texturing, lighting, rendering layers and passes, optimizing viewport performance, establishing project structure and so on, to make a detailed picture. In 1880 young Nikola Tesla proved the existence of the Ether and capability to use rotating magnetic field to create the lift force directed upwards. Tesla believed that the technology was the common heritage of mankind, thus he sent packages with the detailed description of the technology and all the instructions for the production of “Ethereal engine” to Governments of all the major world powers. The British Empire, wanting to establish the status of not only the greatest sea power, but also the greatest air power, first managed to build a shipyards and lay the fleet of armored airships on them. Invulnerable to anti-aircraft fire, carrying a heavy armor, well-armed and maneuverable airships of Her Majesty’s Air Fleet started to terrify enemies of the Empire. The idea of the picture can be described like this. However, it has begun with searching of composition for the blurred image in my mind: huge zeppelins flying through the archway. Right away I was trying to formalize this image on paper. 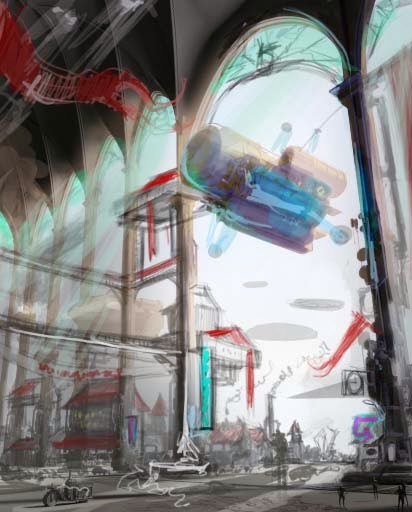 I came up with open environment, light and shadow play, Gothic cathedral with ribs on the arches, dark spots of the ships on a light background of the sky. St. Vitus Cathedral in Prague served as a starting point for the sketch. This epic structure contains rhythm, movement, contrast in its forms. It inspired me a lot during sketching phase. After sketching out tonal values of arcade and also a heavy blob of zeppelin, I opened Blender and prepared to modeling. Before speaking about modeling, let me briefly explain how my workflow is organized and say few words about folder structure. I find it really easy to underestimate the meaning of organized folder structure and then to lose track of project. Thus, it’s highly advisable to create some sort of structure that will protect the project from chaos and entropy. Download – virtually everything that’s downloaded from internet goes here. 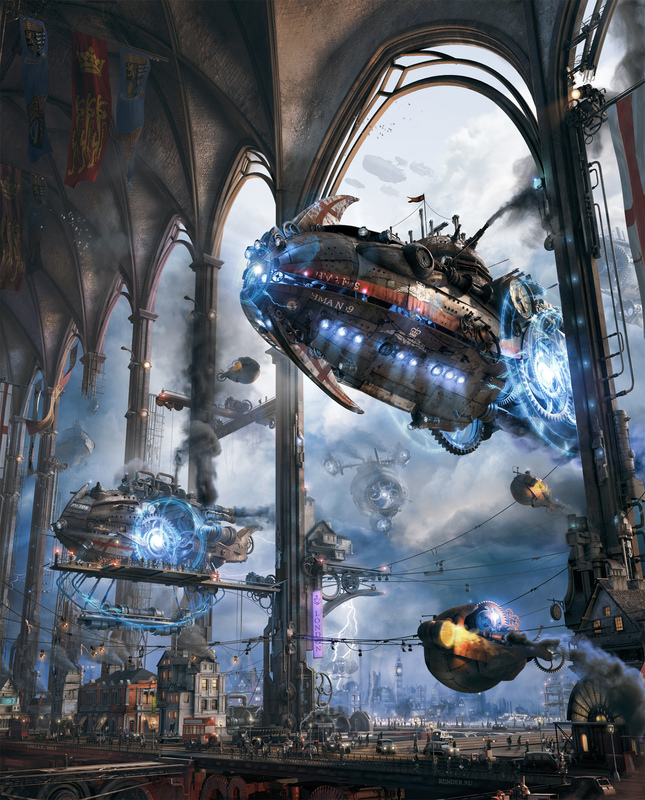 Folder contains subfolders – steampunk, trains, zeppelins etc. Saves (ps) – same goes for photoshop of gimp files. Usually, source files for textures. Test – this folder contains experiments and alternative versions of the scene. Essentially, it’s a testing chamber for things that can break scene, crash Blender or whatever. Quick tests are being done in an empty scene and later on are merged into the ”trunk” scene. 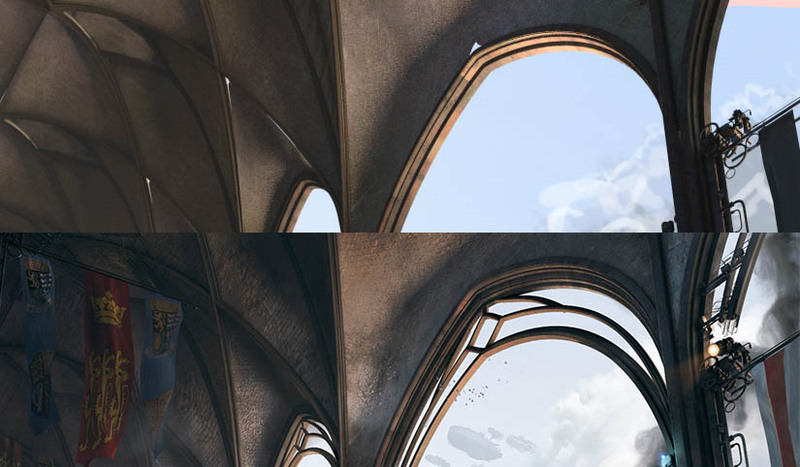 Textures – textures which are referenced by the scene. Files are given descriptive names: scene_zeppelins__01, tex_metal_rusty_02, ps_compose_final and so on. 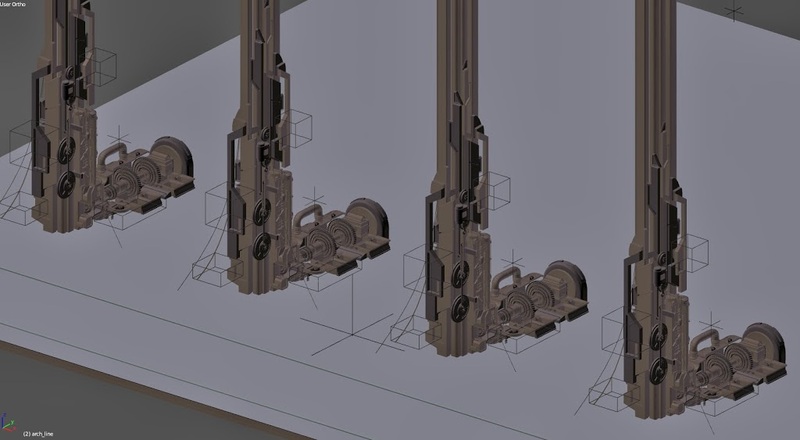 Personally, I can rarely move consistently from sketch to modeling, from modeling to texturing and so on. If a scene is full of objects, there comes a time when separation on stages becomes meaningless. When it happens, it becomes easier to think of groups and layers rather than stages. This is partly due to the fact that all the components of the scene interact with each other. For example, if we move the light — the specular highlight on material changes, if we add a model — we introduce a shadow. If color of the texture on the columns is tweaked — the ship is being lit differently by secondary global illumination bounces. In turn, all of the above influences render setup. I often return to sketch phase to take a look at what can be improved and changed about composition. Sometimes modeling of the details distracts from seeing overall picture. When it happens, it’s cool to return to sketch and continue searching for the impulse that drives the composition. If nothing comes to mind, try searching for the pictures of cg artists that inspire you. Or generate some random shape to start the ball rolling (who said fractals?). Blender proves itself as a reliable tool to make this kind of stuff. Scene contains nearly 7 mln. polygons and many layers of things – and continues to be manageable. 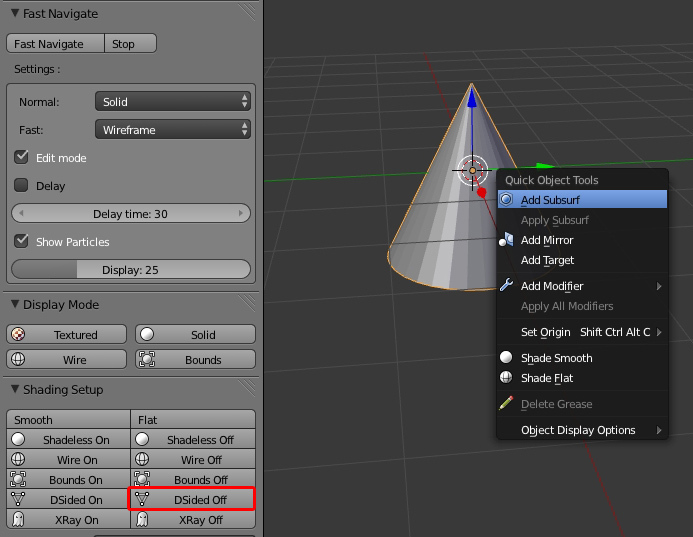 Let’s briefly outline some useful Blender addons, especially ones which accelerate viewport. 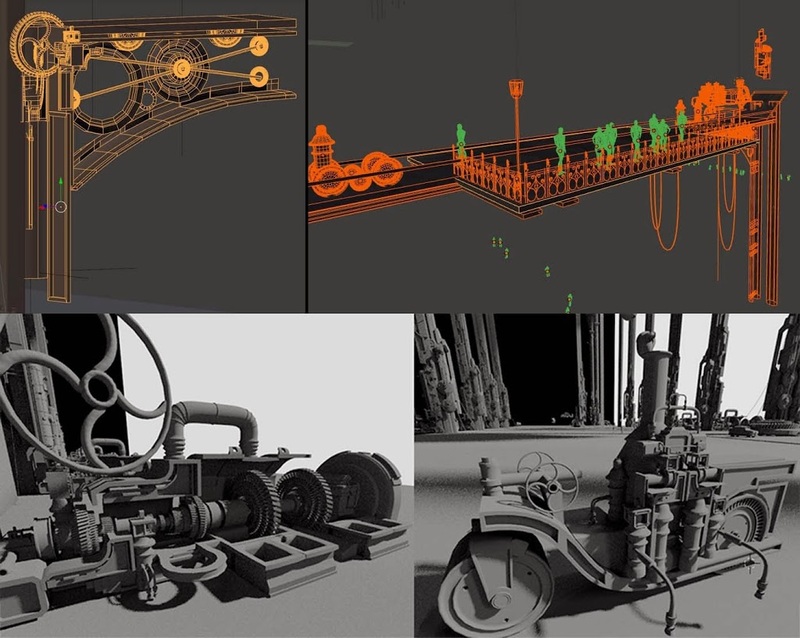 Quick tools – macro by Johnathan Williamson from CgCookie. 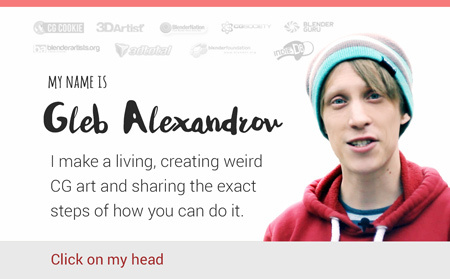 On pressing Q we get menu with a pretty useful stuff: symmetry, modifiers, shading modes. The main purpose of this addon is to save our clicks. For example, we can press Q and slide to Add Mirror, than press Q – and click Add Target. This way, Mirror modifier is activated and Empty Object is created on 3d cursor coordinates. This Empty is automatically set as Mirror Object. Very convenient. Material Utils – tool to assign materials to multiple objects at once. Display Tools – tools for viewport setup, made by Jordi Vall-llovera Medina “JordiArt”. Let’s take a look at some of the most useful functions. Fast Navigate — during navigation viewport switches to bounding box mode. 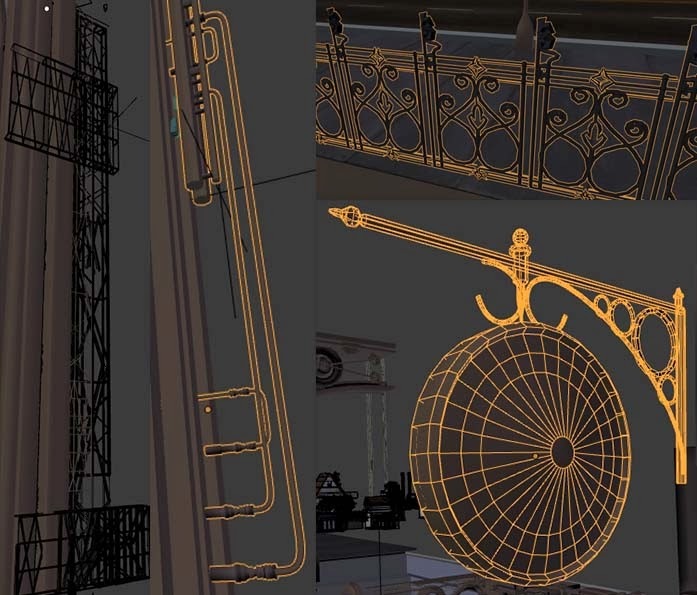 There is a similar feature in 3ds max. 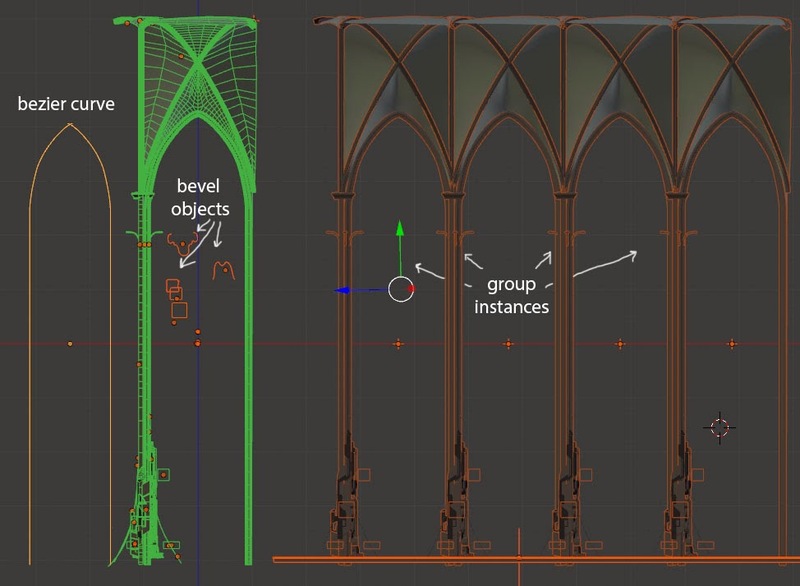 Wire On – similar to 3ds max F4 function, displays wire over mesh on multiple objects at once. Double Sided off – mass disables property “show double-sided” on selected objects. This setting alone makes the viewport much more responsive. Without it the viewport begins to feel slower on approximately 1 mln polygons, and goes completely slow on 2 mln (on my Geforce 550m). With double-sided off it feels smooth on 5-7 million polys. Another crucial setting for viewport acceleration is VBO (Vertex Buffer Objects), which is found in system settings. 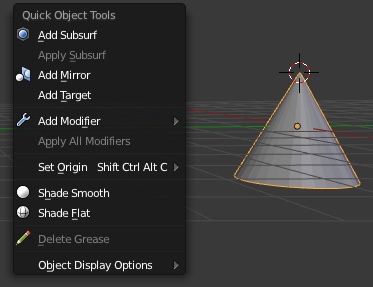 Also, subsurf modifier on top of modifier stack ignores VBO, therefore, we can add empty modifier (simple deform with zero value) on top of stack to override this bug. Hotkeys. We often need to switch viewport to rendered mode and back again. By default, there is no hotkey for this function. Fortunately, it can be set manually by changing some values in input section. During the arcade modeling group instances were used. Changes to original group propagated to all instances. For example, when mechanisms were added to the source group, they appeared in every instanced group. Arch is bezier curve with bevel object. Some objects were modeled using the new grid fill tool. At first, camera was positioned high in the air. Later on, it was positioned roughly at eye level to enhance the feeling of a huge environment. Tiny figures were placed here and there for scale reference. 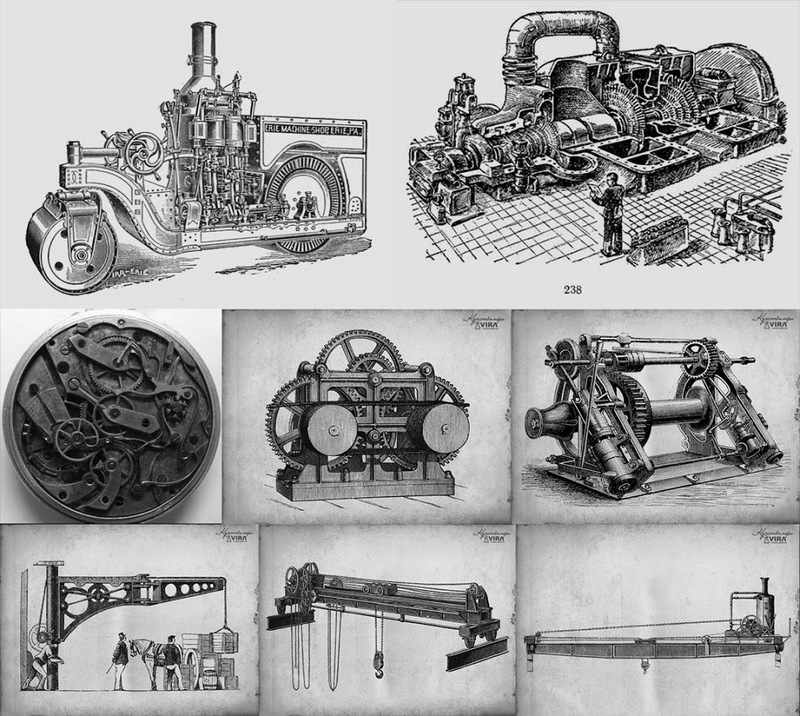 Mechanisms were done according to the references of steam engines, locomotives, clock mechanisms, cranes. From time to time some details were being copypasted, then rotated and scaled before placing. Later on I decided to add a pit at the foreground, to make things look more technological. 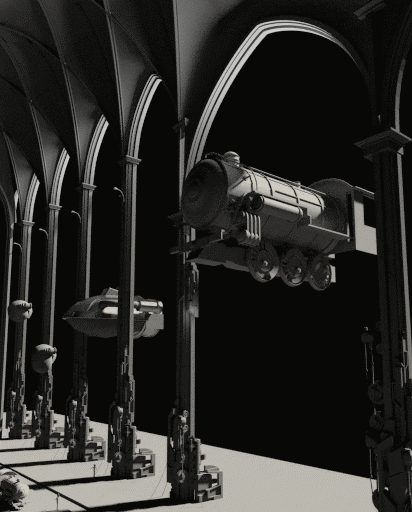 Once it was done, I thought that it would be cool to make entire cathedral float on anti-gravitational engine. But soon this idea was left behind because I wanted to be closer to London street life. Once again, already modeled elements were transformed and used. 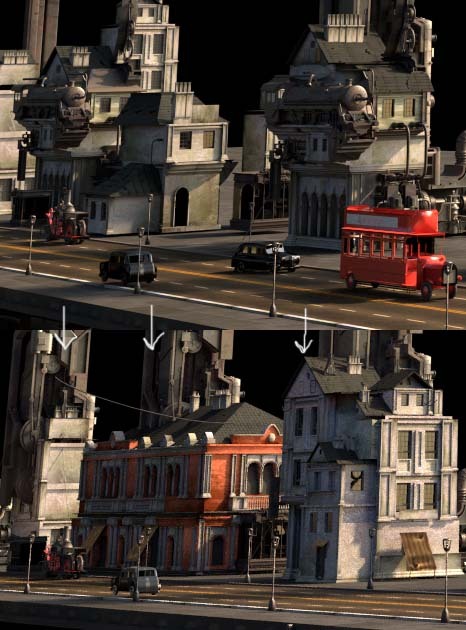 To make city believable, it was decided to add a road with cars and change design of houses from fantasy-styled to more grounded. When the basis of the scene was done, detailing phase has begun. The column (also the symmetry) was broken, then lanterns, spotlights, lamps and elevators were created. After that cloth was simulated, dome material was changed to add visual interest and provide one more scale reference – tiled bricks. 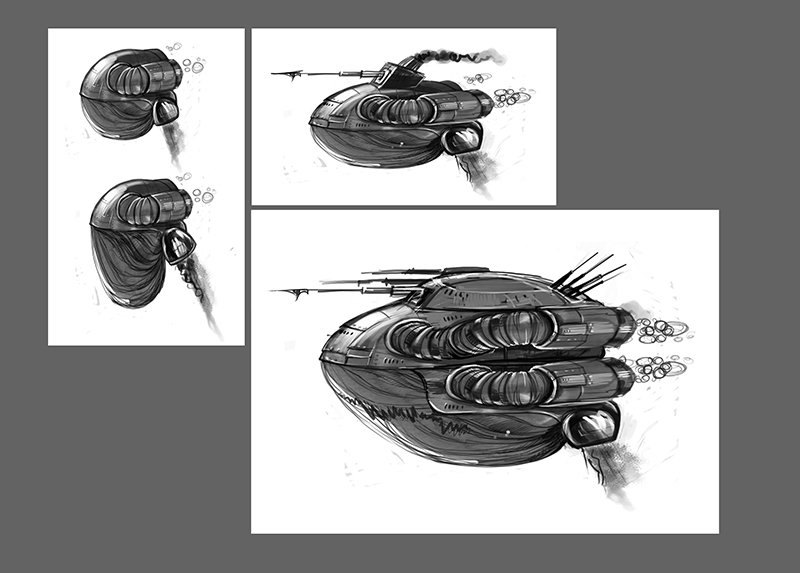 Ship concepts were reworked at least three times. 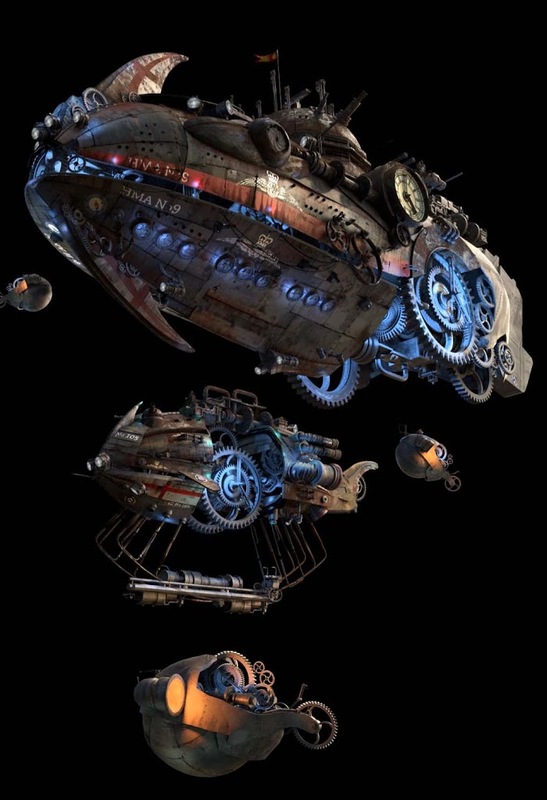 Nevertheless, all three versions are shaped like a zeppelin – thought stubbornly refused to depart from steampunk motive. 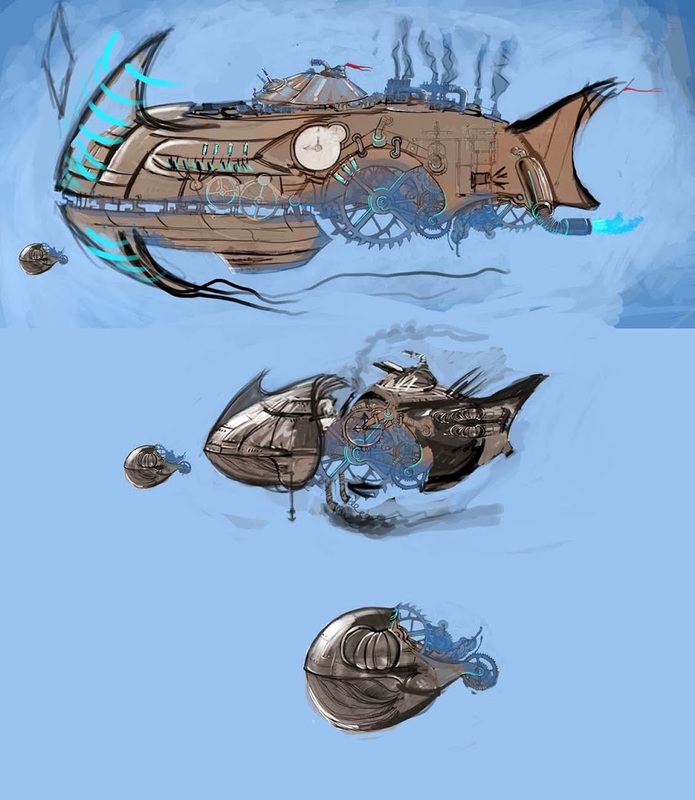 The first version of the ship was a funny fish with a harpoon and a soft belly. Then came the idea to do something like an air locomotive assembled from parts of the “terrestrial” trains. But this idea did not work. The third version was the final – a zeppelin with a rotating magnetic field (we can also fantasize about chrono-engines and how they distort time and gravity). The fins on the front of the ship have been added to break up the phallic shape and enhance the silhouette. Later, they came in handy when I was looking for a place for marking. Moreover, it was funny to imagine zeppelins as fishes or submarines in a surreal air-water world. To determine the function of a ship and its belonging to Her Majesty’s Navy, special details were added. Flagship got bomb doors, guns, heavy armor (gears are protected by magnetic field), extra antigrav engines to maneuver and the spotlights. Tactical designator – HMA – stands for Her Majesty’s Air Fleet. Such labeling existed in reality. Also used winged badge of Royal Flying Corps. 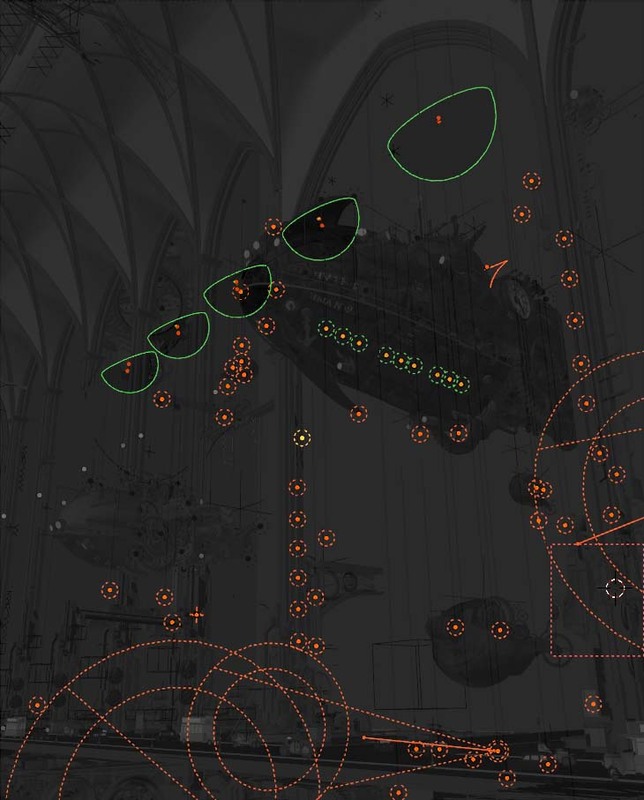 The remaining zeppelins were unwrapped mainly through smart uv project, box mapping and project from view. 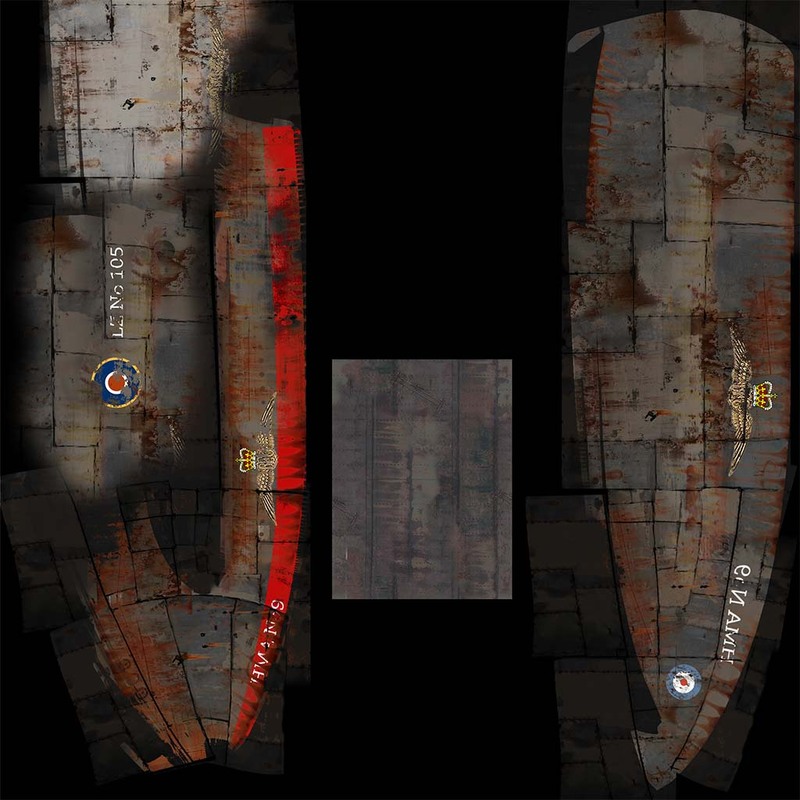 Uv islands obtained during unwrap were located on the texture of the main flagship. Lighting was set at the very beginning, and since then the base has not changed. The main light sources are the sun and the hdri. While processing hdri, I was trying to tint one side of the “sphere” in cool tones, and the opposite side in warm. Dome was highlighted separately to achieve rhytmical light and shadow separation. I was constantly adding omnis to illuminate details and accentuate colors. All additional light sources were put on a separate layer, so they don’t clutter viewport and slow down the renders. Now I think that lights could be placed more rationally. But such scheme worked and it I decided to let it be. Render layers also got render passes. Rendered ambient occlusion, z-depth (or mist), diffuse direct. To automatically export all this stuff I used addon called Save Layers and Passes in respectively named folders by Tamir Lousky and Luciano Munoz. 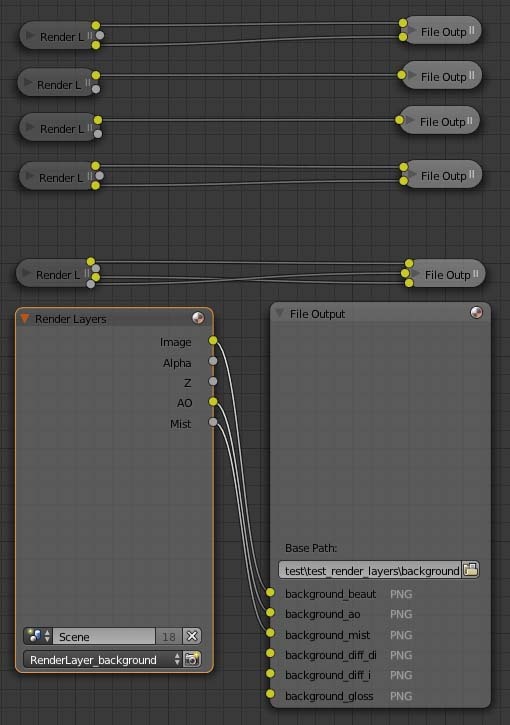 Very handy thing, did not have to manually set the node compositor, indicate the names and folders. Rendered on CPU, because video card refused to handle 10 million triangles. On average, the level of noise in the picture was getting satisfactory after 500-1000 samples. Although, layer with an arcade demanded 4,000 samples because of small omni lights. 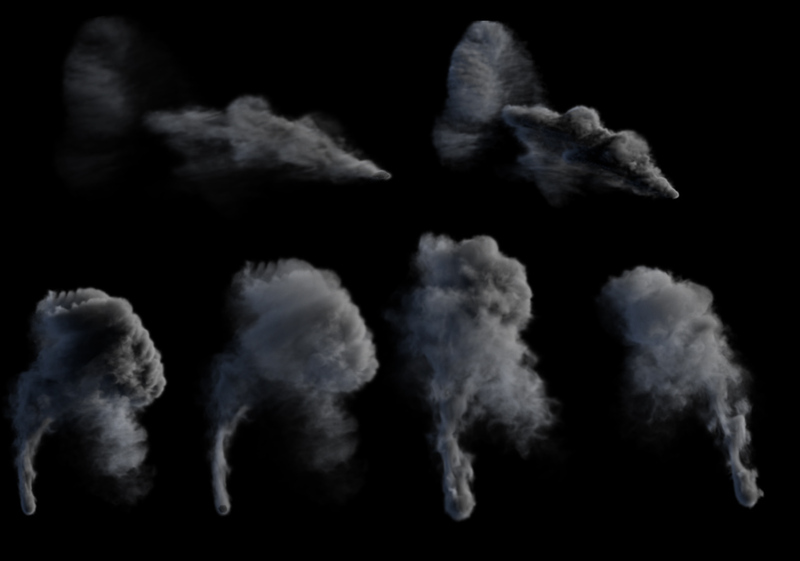 Smoke was simulated in Blender then added on top of the compose. 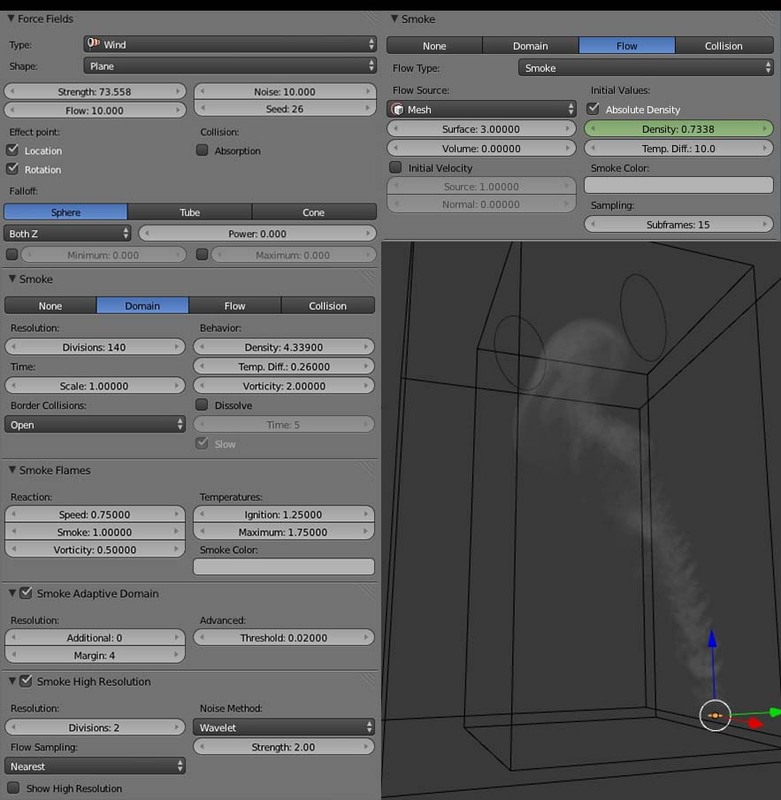 Emitter smoke density is animated from zero till one (0-80 frame) to eliminate big smoke puff. Also, smoke was blown away by the wind. 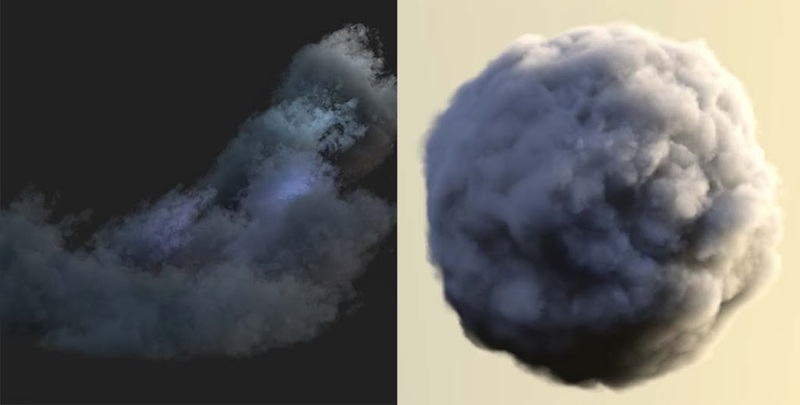 Tried to render cloud for background using Nick Keeline’s impressive addon called Cloud Generator. During the tests realized that results are only suitable for mixing with main background in small doses. Nevertheless, pointed out for myself that such clouds can fit somewhere in the future. 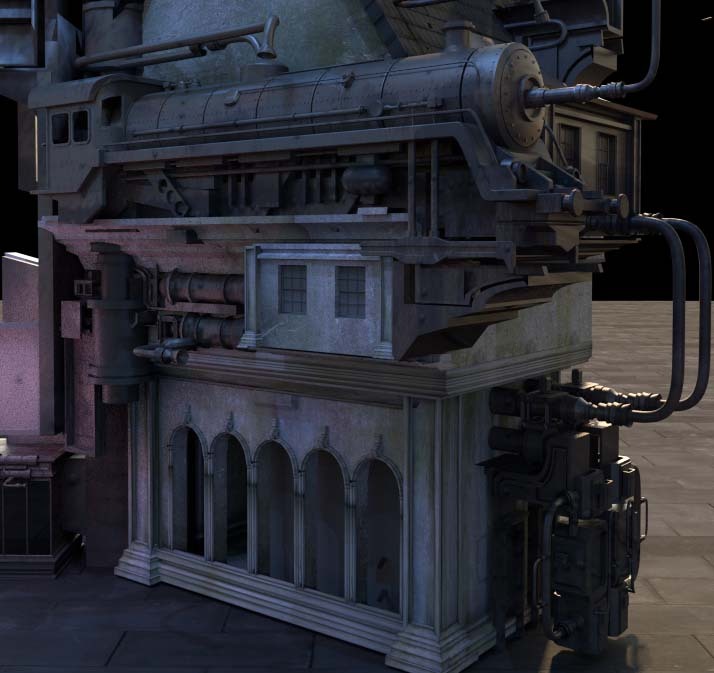 For ships, buildings and arcade ambient occlusion pass was mixed with rgb pass (multiply mode). Later on aerial perspective was added with the help of z-depth pass. Painted/collaged backdrop. Tried to achieve the atmosphere of approaching storm. The city with Big Ben, a fixture of Englishness, had to serve as a reference to London. 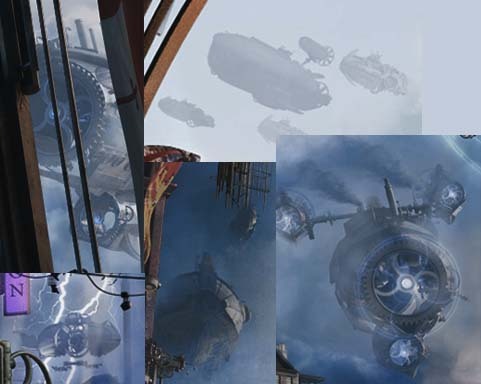 People were replaced and background ships added. A small lanterns were lit and also a side lights and beacons. Volumetric light came into play. Decision was made to focus on the ships and to visualize the magnetic field generated by the antigrav-engines. The basis for the field was modeled and then in post-processing it was given a glow. Vignette and color correction glued all parts of the picture together. Color range was driven by complementary colors, shades of cool blue and warm orange-brown. All in all, the picture became sufficiently solid to be finalized. Some ideas about what could be done better: some items are not logical at all, for example, gears floating in the air without any anti-gravity. Humans and machines, for sure, demand more polish. Perhaps gone too far with the smoke (although I like how smoke looks in steampunk setting). Overall, I was pleasantly surprised by the positive reviews that picture have received in the discussion on Render.ru, Blenderartists and Blender3d.org.ua. It’s really motivating. I want to express my deep gratitude to my wife, who was helping me with practical advice and delicious coffee during the process of production. On top of that, many composition and stylistic decisions were taken in tandem with her. Thank you. All the luck and success! Stay tuned and feel free to leave a comment.